My dress… My dress was an a-line, white floaty gown with some floral detailing on the skirt and on the waist. I got it from Myrtle Ivory in Dublin and I bought my veil from Little White Dress. 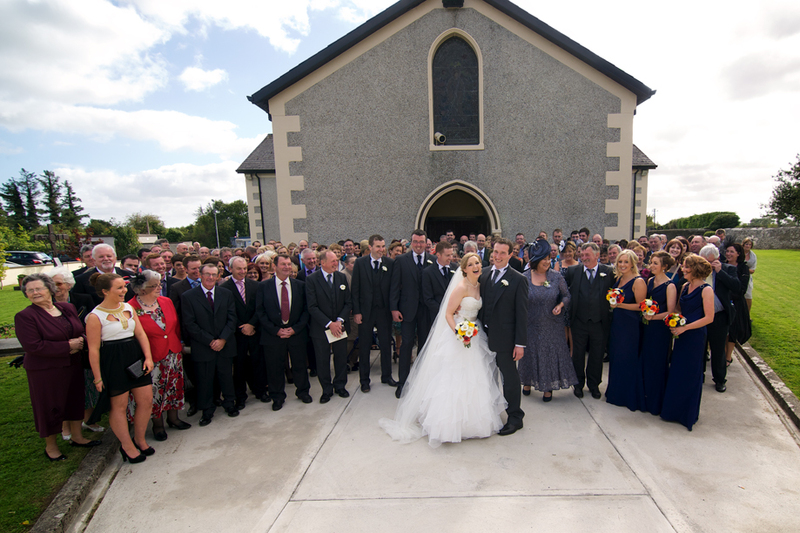 Our ceremony… Our ceremony was like one big ceili. Myself and the girls arrived in a VW campervan and I had a procession of thirteen of my nieces and nephews going before me when I walked up the aisle! My one year old nephew Dannan who was only learning to walk made it up the aisle on his DIY walker that had been attacked with lavender, hessian and hydrangeas which sported the sign ‘Here Comes the Bride’. 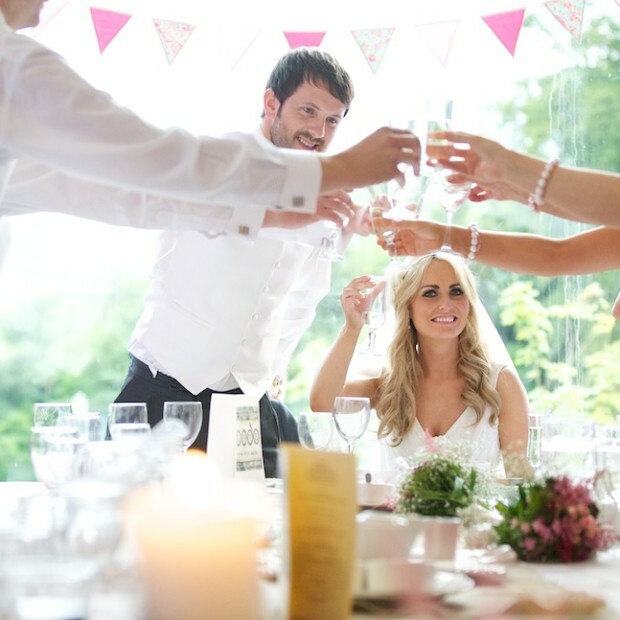 We chose our venue because… We wanted a laid back venue which would allow us to be creative with the decor and Mulranny Park Hotel gave us full control to make the day ‘ours’. Our wedding colours/theme… The key colours were pastels and nudes and mismatch fabrics. All the flowegirls and bridesmaids wore laid back bohemian dresses and the pageboys wore suits teamed with converse. The flower girls looked like magical forest nymphs styled with boho flowers on their heads. The ultimate DIY wedding… We roped in all of our family and friends to create the ultimate DIY wedding. My Sister Sara pimped jam jars into vintage creations, my father in Law paschal supplied old tree cuttings for the table numbers, my mam made all the hessian table runners and vintage patterned cravats for the children, my friends Mairead & Sinead made the bunting, my bridesmaid/sister Orla made the cake stand, my bridesmaid/sister Dearbhla created the Sweet shop. My sisters in law Rose, Tina and Val brought along all their DIY vintage touches from home including their mother’s vintage china. My dad and brother Tom helped with the lights. Every family member on both sides had a part to play in the DIY production line. All our families and friends got involved. I was blown away by the room when I saw it finished. The details… We added a lot of small touches like a sweet shop for the children and a dessert table buffet for the big kids to really add to the fun. We spent a lot of time and effort on the small details even though lots of people say these things are not noticed we absolutely disagree! My favourite moments of the day… The whole day was one hell of a hooley that continued well into the week after. I have so many favourite moments of the day and here are just a few: the overwhelming butterfly feeling I got in the pit of my stomach (that feeling you get when something feels so right ) when I saw Stevo standing handsomely at the top of the church, the energetic entrance procession up the aisle of my thirteen nieces and nephews, the ceili atmosphere in the church, the craic in the VW campervan as it tried to mount the sand dunes on Mulranny beach, the heartfelt speeches, the spectacular rendition of Lion Man by our mate Ciaran Malone, the major craic, breakdancing and moshing that happened on the dancefloor and the everlasting smiles on all our families faces which added to the true magic of the day. Lovely photos Gary. I love the details and the extra effort this couple went to. The names for guests at the tables are cool! The VW vans are awesome! Gorgeous gorgeous gorgeous! So much effort and personality gone into this wedding, it’s stunning! Beautiful wedding and gorgeous photos, how did they make those fans??? I am looking to make some for my own wedding and those look great!